Basically, I've hit a writers block for making cards. So, by using the idea many other people have had to make cards about people. Just tell me a little about yourself and what kind of card you want and I will make it. Hi @pjbear2005. 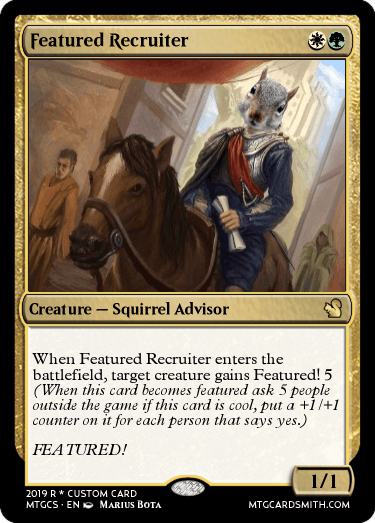 I'm Corwinnn and I'd like to see a card with the creature subtype "Advisor"
Hello! Can I have a black and white pug if possible? @pjbear2005 if your stumped you could hit up creature feature or mystery box challenges. Im fairly active but i try not to purposely 'bump' my contest as it is ongoing but its generally there for this very reason, and deadlines change sporatically there as well to change it up a bit over time. But if your wanting to do this concept still, itd be cool to see you make me a card too! Lmao!!!! Featured Recruiter is phelgming with @Corwinnn's head! ...ooor is it Corwinnn with phelgming's body...? @Tomigon yours is on the way! 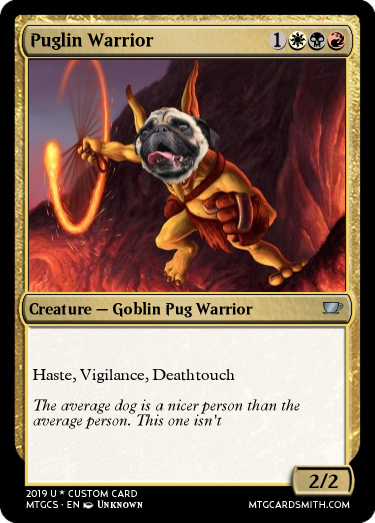 Hi Peejay, I would like an Atog creature Who feeds with something Creative/unexpected. Colour(s) is up to you. 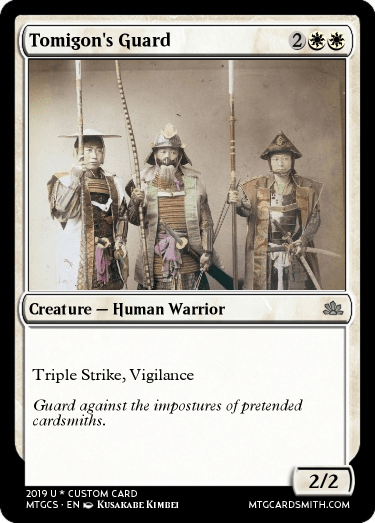 @pjbear2005 this should be a Cardsmith movement! Can you make a better version of my Lucas Nightail card? But only if you know what Wizard101 is, if not, I can think of something else. @dibbydubsdubs, last year i picked up this topic from @kandra127 and made a contest about it called Cards of MtgCardsmiths. I can start a fresh one for you guys to drop cards in if you guys want for this year, what do you think? Can you make a card that counters (not a counterspell) Vannifar? I'm @Faiths_Guide, and I'd like to see an Advisor creature that is not White or Green. An assassin creature, if you will! I'm @KJMartin, I'm 14 and live in the UK. I would like to see a balanced version of an extremely broken real Magic card (so a card like a mox with some downside or something, or a conditional lightning bolt).